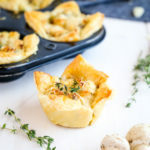 These Creamy Parmesan Mushroom Cup Appetizers are the perfect finger food for New Years Eve and holiday parties. They're easy to make and perfectly savory! Cut your defrosted puff pastry into 3 1/2 to 4 inch squares and press gently into 12 muffin cups. Place the muffin tins in the freezer for the dough to firm up while you're making the filling. Heat a large skillet over medium high heat and add the butter. When the butter is melted, add the diced onion, garlic, mushrooms, and thyme and saute until the vegetables are very soft. Add a splash of white wine and some salt and pepper too. Turn off the heat and turn the mushroom mixture out onto a plate to cool. Mix the softened cream cheese and the parmesan cheese in a bowl with a spoon and add the cooled mushroom mixture, stirring to combine. Remove the muffin tins from the freezer and divide the cheese and mushroom mixture between the 12 puff pastry cups. Top each one with a little bit more parmesan. Mix the egg with a splash of water and brush it onto the parts of the puff pastry that are visible (hanging over the sides of the muffin cups). Bake at 350 degrees Fahrenheit until the puff pastry is golden brown and the filling is bubbly (about 20 minutes). To make ahead, assemble the appetizers up to one day ahead and store in the fridge until ready to make, covered in plastic wrap.